LEGO Ninja Turtles Shredder’s Dragon Bike features dual flame exhaust, rubber-treaded tires and a sewer map. Includes 3 minifigures: Shredder, Donatello and a Foot Soldier…. 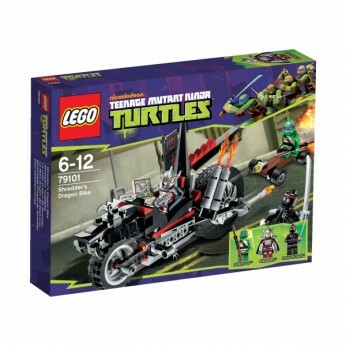 This toy costs approximately £24.99 (for the latest and best prices make sure you check our retailer list for the LEGO Turtles Shredder’s Dragon Bike 79101 above). In our review of LEGO Turtles Shredder’s Dragon Bike 79101 we classed it as being suitable for ages 4 years, 5 years, 6 years, 7 years, 8 years but recommend you check the manufacturer specific advice before purchasing.